Korea's high suicide rates are widely known, and there have been plenty of attempts to explain why Korea has such high suicide rates. The proffered reasons range from the unwillingness to discuss mental health, Korea's cultural trait of "han", celebrity suicide affecting the general public, etc. There may be even a genetic explanation -- a study showed that Asian Americans have relatively less "long genes" that produce serotonin, which regulates mood. But although these reasons may be correct and practically helpful, they fail to understand the fundamental cause of the prevalence of suicide in Korea today. Why are these reasons inadequate? Because they do not explain the dramatic increase in suicide beginning in the late 1990s. 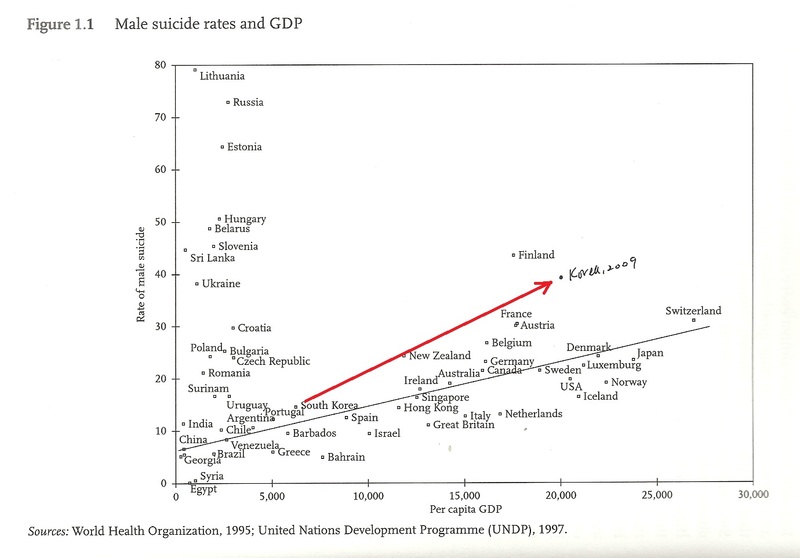 As we discussed in the previous part, Korea actually had a very low rate of suicide as recently as mid-1980s. Currently, the average suicide rate in the OECD is 11.1 per 100,000 people. In 1986, Korea's suicide rate was only 6.6 per 100,000. Even in 1995, Korea's suicide rate was 10.8 per 100,000. Given this data, it does not make sense to blame, for example, Korea's lack of mental health awareness for Korea's incredibly high suicide rate in the recent years. (31 per 100,000 people in 2009.) Korean people had even less awareness in mental health back in 1986, when the suicide rate was less than one quarter of the present day's. It makes even less sense to blame genetics, as Korean people's genetics could not have changed in just less than 30 years. Whatever the answer is to Korea's suicide problem, it lies with what happened with Korea in the last few decades. What happened in Korea in the last few decades? Recall what the Korean wrote previously -- the keystone knowledge that is required to understand virtually every aspect of modern Korea is that Korea went from one of the poorest in the world (like sub-Saharan Africa where finding something to eat was a daily struggle) to one of the richest in the world (like mid-tier European country with some of the world's most cutting edge corporations) in just 60 years. Korea's process of modernization had no precedent in human history in terms of its magnitude and speed. This means that every social change that followed, say, a Western European country developing at a "normal" speed, happened to Korea in that compressed time period. 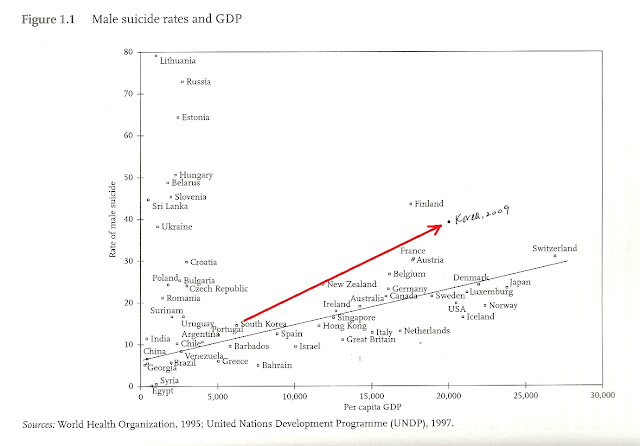 One of the most basic theses about suicide is that there are more suicides in rich countries. As we will discuss further below, industrialization and growing wealth are positively correlated with increasing suicides. And we can see that Korea is essentially following this broad trend from 1997 to 2009. As we pointed out just now, the pace of change for Korea is faster than what might be expected -- the line between Korea of 1995/1997 and Korea of 2009 is steeper than the regression line. But it is clear that what Korea is experiencing in nothing new. Other countries experienced what Korea experienced as well. Then, in order to understand Korea's suicide problem, we must first understand what happened with other countries that modernized. Luckily for our purpose, the sociology of suicide began almost with the birth of sociology itself. Emile Durkheim, considered "Father of Sociology," presented his seminal study on suicides in the late 1890s. Thanks to Durkheim and the sociologists who followed him, we have a reasonably clear picture of sociological data regarding suicide going back to more than a century. Although over a century old, Durkheim's initial insight about the social causes of suicide is still valid for the most part. Durkheim believed that essentially, suicide is a disease of modernity. Durkheim formulated his thoughts by observing France of the late 19th century, which -- along with the rest of Europe -- was witnessing both a spectacular economic growth and an astonishing rise in suicide rate. (In earlier 1840s, France's suicide rate was around 10 suicides per 100,000 people. By mid-1890s, the same rate was around 24 suicides per 100,000 people.) And regardless of the significant diversity among various European states, suicide rate rose in almost all European countries. Moreover, again across most European countries, suicide rate rose more dramatically in the cities while remaining stable in rural areas. A lot of Durkheim's more specific insights proved to be correct as well. Durkheim believed that the deterioration of the traditional family contributed to suicide. Sure enough, there is a clear negative correlation between the number of children and the rate of suicide. Likewise, there is a fairly clear positive correlation between the rate of divorce and the rate of suicide. But Durkheim was not entirely correct. 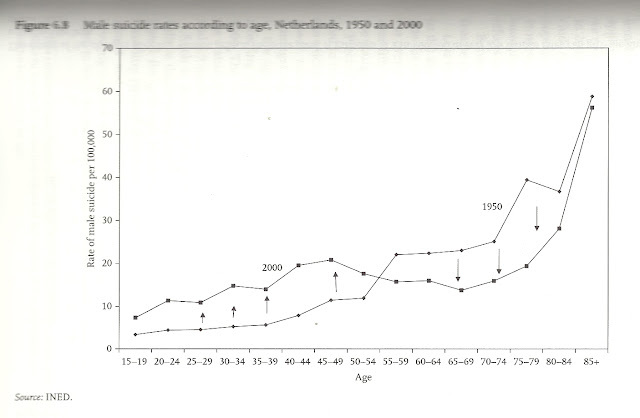 As it turns out, Durkheim made his observation at the peak of the rise of suicides in Europe. In the early 20th century, suicide rate across Europe stabilized and subsequently decreased. To be sure, the suicide rate did not fall as low as it was in the early 19th century. But even as Western Europe enjoyed another spectacular economic growth in what is commonly referred to as Trente Glorieuses (30 glorious years) between 1949 and 1978, suicide rate remained stable -- partially negating Durkheim's idea that greater wealth will cause greater suicide. Sociologists explained this reversal with the idea that, essentially, people became used to living as individuals in an industrialized economy. In this sense, one can understand suicide as caused not by wealth and individualism alone, but by the friction generated in the course of moving from a traditional, agrarian lifestyle to a modern, industrial lifestyle. After a period of chaos, people eventually develop a series of new relationships with their families, coworkers and strangers (among which, importantly, are psychotherapists,) which again protect them from suicide like the way traditional relationships protected them. However, it is important to note that this "new individualism" does not protect everyone in a "mature" industrialized society. In particular, suicides in a wealthy industrialized nation disproportionately occurs among the poor, which is seemingly contradictory to Durkheim's idea that wealth leads to suicide. Sociologists explained by coming up with the concept called "disqualifying poverty." Poverty in a wealthy country is unlike poverty in a poor country. A poor person in a wealthy country is "disqualified" from enjoying the fruits of the society's wealth. A poor person not only lacks the money to access the goods and services that make people happy in a wealthy society (again, psychotherapy being one example of such services,) but is also socially disqualified from having a relationship with many different people. "Disqualifying poverty" can explain this trend as well. Modern industrial society began to gradually add on welfare programs, which tend to favor the elderly. Older people are also generally wealthier, which again allows them to access all the blessings of a wealth society. In contrast, youth unemployment -- something that bedevils most industrialized countries -- might be a cause for the slight increase in suicides in younger ages. Other Durkheimian suicidogenic factors can be easily found in Korea. Durkheim predicted that more education would lead to more suicide. In Korea, only 22% of the population was literate in 1945; now, 82% of all Korean high school students move onto a 4-year university, the highest rate in the world. Fertility rate is negatively correlated with suicide rate, and sure enough, Korea's fertility rate decreased from 4.53 children per couple in 1970 to 1.2 children per couple today. On a similar note, divorce rate in Korea increased fivefold between 1970 and 2000, such that Korea's divorce rate is now one of the highest in the developed world. It is no surprise, therefore, than Korea's development between 1970 to today would result in an increase at an even greater speed. In fact, from a sociological standpoint, what is remarkable about the suicide trends in Korea is not the fact that it is increasing so rapidly now -- it is the fact that Korea's suicide rate was very low until late 1980s. In fact, between the 1960s and the 1980s, there are indications that Korea's rate of suicide decreased as quickly as it increased between 1997 and present. Reliable data about suicide rate in Korea prior to 1980s is difficult to come by, because the country's desperate poverty did not allow for a systematic collection of statistics. But according to one study that estimated the rate based on suicides reported on newspapers, suicide rate in Korea was as high as 28.6 per 100,000 in 1963. In other words, while Korea's per capita GDP increased by around 6000% (!) between mid-1960s to mid-1980s, Korea's suicide rate decreased by more than 75%. Korea in the 1980s would have made Durkheim's head spin sideways. How could this have happened? First of all, it must be said that Korea's starting point (i.e. suicide rate in the 1960s) was abnormally high, because Korea was still suffering from the mother of all social disruptions -- Korean War. But that alone does not explain how Korea managed to get the suicide rate down to as low as 6.6 per 100,000 in 1986 -- lower than France's suicide rate in 1845, which was before France's suicide rate took off to a degree that alarmed Durkheim. Although the Korean could not identify a reputable study on this point, his personal theory is that the East Asian development model -- first employed by Japan, then by Korea, and currently by China -- was responsible for bringing about an incredible economic growth without the dramatic increase in suicides that followed the economic developments in Europe. As the Korean wrote previously, South Korea of the 1970s and 80s was, ironically, a better "workers' paradise" than any communist country ever was. Anyone who wanted a job could get one, as unemployment hovered around 2% (!) for around three decades. At its zenith in mid-1990s, it may have been proper to refer to Korea as a "corporate republic." As Korea's large corporations constantly complained of being unable to find enough skilled workers. they provided what might be called a "full service" employment for their employees -- the employees were given free housing; their children attended the company-provided schools and receive tuition subsidies for colleges; few people were ever fired and everyone's salary rose with seniority until the retirement age; after retirement, there was pension and medical care from the company. As we discussed earlier, it is not the wealth itself that causes increased suicide, but the process of change from a traditional to an industrial society that causes increased suicide. Korea's (relatively) unique economic development as a corporate republic allowed for an economic rise with as little stressful disruption as possible. From a social life perspective, working at a typical Korean corporation was not all that different from working as a farmer in a traditional village. As the entire village worked together on rice paddies, the entire company worked together on a project. As the village collectively provided what might be called "social services" today (e.g. childcare, healthcare, etc.) modern Korean corporation provided the same. Most importantly, few people were fired, and few people ever moved from one company to another. 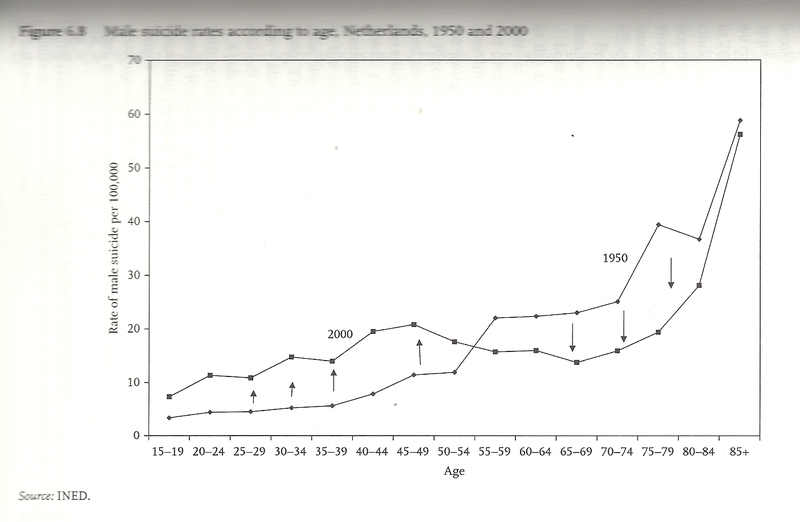 As a result, Korea's suicide trend essentially went through a trajectory opposite of Europe's. In Europe, suicide rate increased rapidly in the beginning of industrialization, and then decreased and stabilized in Trente Glorieuses even as wealth increased dramatically. In Korea, wealth increased dramatically first while suicide rate decreased. Then in 1997, Korea would run into an inflection point. The inflection point, of course, is the East Asian Financial Crisis of 1997. As the Korean explained previously, East Asian Financial Crisis and IMF's bailout of Korea in 1997 meant that Korea's days as a corporate republic was over. In all fairness, it must be said that even before the calamitous events of 1997, Korea's corporate republic was already showing signs of strains -- it was entirely possible that Korea would have ceased to remain as a corporate republic even absent East Asian Financial Crisis. But East Asian Financial Crisis meant not simply that Korea's economic model ended, but that it ended like a speeding car running into a brick wall. The biggest companies disappeared overnight, and millions of people were left to fend for themselves. The labor market no longer protected the workers. Social services provided by the government were woefully inadequate, as those services were previously provided by large corporations, which either ceased to exist or could no longer afford those programs. In the introduction of this series, the Korean explained that Korea's high suicide rate has much to do with the fact that Korea, as a society, condones an incredible level of ruthlessness and cruelty to those who lose out in the social competition. But it was not always thus -- until 1997, Korea had a place even for those who lost out in the capitalistic competition. After 1997, not anymore. Of course, Korea recovered from the East Asian Financial Crisis relatively quickly, and is now at an economic catbird seat even as America and Europe are living the experience of what it went through back in 1997. But the Korea that emerged out of the East Asian Financial Crisis was not the same as the Korea of pre-1997. As IMF demanded Korea make severe austerity and neo-liberal economic reform, post-1997 Korea's capitalism began to look awful lot like that of late 19th century France -- an economic free-for-all when only the strongest survived and the weak were cast aside. It is no surprise, therefore, the Durkheimian suicidogenic factors descended upon Korea with a vengeance. It has been only 14 years since the onset of East Asian Financial Crisis, so perhaps it is not fair to expect Korea's suicide rate to decrease soon. The suicide rate will not decline in the short term, because Korean society has not yet developed the usual backstops that nullified Durkheimian suicidogenic factors in other industrialized countries. The "new individualism" -- which took approximately a century for Western Europe to develop, by the way -- has not yet taken root in Korea. As many have correctly pointed out, psychotherapy in Korea is not widely utilized. The "disqualifying poverty" also became widespread in Korea after East Asian Financial Crisis. Such poverty has not decreased even as Korea successfully hauled itself out of the abyss, because of the income polarization meant that the wealth created from Korea's recovery was not evenly distributed across the society. The old people in Korea are not protected like old people in Western Europe, because Korea's old people are not protected from disqualifying poverty through government mandated social welfare programs. The fact that Korea is now discussing the establishment of a meaningful social welfare system -- next year's presidential election will almost certainly revolve around which party can be a better architect of social welfare -- gives one a sense of how much longer Korea will have to deal with its elevated suicide rate. In the next part of the series, we will take a closer, ground-level look at how the epidemic of suicide began and spread in Korea since 1997.
dear ask a korean - this is the second time you've done this. but please not that quotes like 1) " sub-Saharan Africa where finding something to eat was a daily struggle" are inaccurate because SUB SAHARAN AFRICA is NOT A COUNTRY. and 2) When Korea was still a struggling agrarian society (decades ago) many countries in sub saharan africa were actually well to do. and were certainly not 'struggling to eat daily". its only today that roles have reversed. and 3) even today, not all countries in sub saharan africa have a food problem. geez dude. its good to be proud of korea, but don't disparage other countries in ignorance. if you're going to cite something you think is a fact, please verify it first. (1) I know Sub-Saharan Africa is not a country. It is obviously a region. So what? What's wrong with comparing a country to a region? Am I not allowed to say, for example, Korea's weather is similar to New England's weather? (2) Again, I know that Sub-Saharan Africa did a lot better than Korea a few decades ago. And again, so what? People (correctly) understand Sub-Saharan as currently poverty-ridden. (3) Sure, not every country in Sub-Saharan Africa has a food problem. And not every Korean in the 1960s had a food problem either. The point is about comparing general poverty, and the point holds. There is nothing disparaging about anything I wrote. You should stop being butthurt at every little perceived insult that is not an insult at all. Another great post! I wonder how the statistics on suicide compare with Japan over the last few decades. I wouldn't be surprised to learn that there are many similarities between the two countries when it comes to how fast they industrialised and the increase in suicides. Then of course there was also an economic hammer blow that started to shake apart the lifetime employment system in Japan too. As always, your English skills leave feeling not a little bit jealous! Not only can I not write in my second language at that level, but I suspect my English skills are even degrading from lack of sufficient daily reading and writing. Have you had this problem with writing in Korean? I thought I should point out though that there are many places where 'the' is missing from your post. Perhaps about eleven? For example, in one place you mention 'Asian financial crisis' instead of 'the Asian financial crisis'. I really couldn't notice any other issues at all. butthurt? seriously? That's the best you could come up with ? Nobody is butthurt at your words as you would put it...except maybe you. You don't like being called out on an incorrect comparison (and even though you claim your words aren't disparaging, the word "butthurt" is pretty disparaging. Or do you deny that as well? The only people who think there's nothing wrong with making country-region comparisons are ignorant people like yourself. You compare Korea to America(USA) ALL the time. Those are both countries so its fine. How come you never compare Korea to North America as a whole? or South America as a whole? Next you'll compare Korea to the Middle East. Naija, seriously, with all due respect.... take a chill pill. How you managed to take this particular serious topic of suicides in SK, look through the entire post, ignore all the valid (and excellent, if I may add) points, and zero in on 3 words ( Sub-Saharan Africa) is stupefying. Not seeing forest for the trees? Naija, I don't know if it is going to make you feel any better - but I totally support you and I think what you said was completely valid and justifiable. You are right - SUB SAHARAN Africa is NOT a country. It is just a geographical term. Please take all the posts for what they really are - just personal opinions. Is there no shame attached to suicide in Korea? Conversely, is it seen as honorable at all? Naija, I believe the Korean meant that he hadn't said anything disparaging in his POST. He never said he wasn't going to be disparaging to YOU. Sheesh. Obviously you aren't very logical. Also, it is completely unfair of you to say that TK thinks of Africa as a country. Any intelligent, well-read person knows it's not. I think you're taking out your anger towards the ignorant minority on the wrong person. I can understand why you were sensitive about it, but the hostility is totally uncalled for. I think TK explained himself pretty well in his response to you. And I should remind you that people compare Americans to Asians ALL THE TIME. I'm pretty sure TK has done it too. I'm Korean and I don't appreciate it when somebody assumes that's the same thing as being Chinese, but sometimes it's appropriate to compare America and East-Asia as a whole. Take a deep breathe and relax. Naija has made a very good point, actually three points. While telling her/him to take a deep breath and relax you are 1. completely ignoring two other comments that s/he has made 2. calling her/his comments illogical, even though all three of her/his comments are completely logical 3. condone and encourage disparaging comments. All s/he asks for is to verify the facts. If you are an expert on Sub-Saharan Africa, could you please substantiate and provide sources that prove that in the whole area of Sub-Saharan Africa finding something to eat was a daily struggle? If so, during what particular period? Thank you. P.S. And don't forget to relax as well. I'm certainly no expert, but here's something that I easily found on the internets: "...while Sub-Saharan Africa remains the developing region with the highest number of people living in extreme poverty, poverty rates have dropped rapidly since 1990, hovering around an estimated 46 percent in 2008" (http://www.undp.org/africa/). Okay, so it seems that economic stability has rapidly increased in that region, but 46 percent still seems like a huge percentage to me. Sure, the other 54% are not living in poverty, but not everybody in Korea was poor either. And yes I understand that poverty is not the same things as "struggling to eat daily," but they do go hand in hand. Btw I believe that TK was comparing the Korea 60 years ago to the present Sub-Saharan Africa, making naija's 2nd argument a moot point. As for point one, I already addressed that. As for the last point: We're making GENERALIZATIONS here. Not everything is going to hold true when you generalize and generalizations can go awry, but sometimes they're needed to get a point across. Anyway, if we insist on taking it to task, take a look at this list of the top ten wealthiest African countries in 2005 (all sub-saharan coutnries with the exception of Libya and Algeria): http://www.clickafrique.com/Magazine/ST014/CP0000000224.aspx. Even amongst the wealthiest countries in Africa, there is a major gap between the wealthy and the poor. In Equatorial Guinea, Africa's richest country, "wealth is distributed very unevenly, with 70% of the population living under the United Nations Poverty Threshold of $2/day" (http://en.wikipedia.org/wiki/Equatorial_Guinea). I'd say that 70% is probably struggling to eat daily. Yet another incredible series! Shirley there's a book in here somewhere? Slightly off-topic, but could you provide any insight into the process you go through preparing these articles. You recent link post show a predication towards reading the NY times and Economist a lot, but how are you getting started with different reading lists and so forth? @ Vivian - Wow! You actually looked into this matter - I am impressed! Thanks! Generalization can be a very touchy issue. If I lump North Korea and South Korea together (I would not do it, but just to prove my point) that would be generalization. But would it be a culturally and politically correct one? There is Southwest Asia, Southeast Asia, there is Central Asia... We can lump them together as Asia - however, if talking about poverty and economic development that would be politically inappropriate and culturally wrong. If you refer to climate, weather, rainfall, geology, tectonics and other physical characteristics that do not concern culture, it may or may not be appropriate, however, if you discuss religion and other touchy subjects - every fact has to be supported by some kind of research. Yes, it is true that many Americans and people from other nations do not differentiate Koreans and mistakenly confuse them with Chinese. This is done because of lack of exposure, education and cultural/political awareness. Just because THEY do it, does it make it right? If a passing comment includes at least one disparaging phrase towards other nations/races, it negates (for those affected) the entire article, no matter how tactfully, brilliantly and skillfully it is written. Look at American politics - one wrong word can make a headline! Just the other day one of the Texas political leaders ( a republican, of course), used the phrase "Jew down," before acknowledging "That’s probably a bad term." I don't think Naija did not enjoy reading the post. I think s/he wanted to convey the message that particular generalization was culturally insensitive to him/her. I am not an expert on Sub-Saharan Africa either so I cannot tell whether that statement was correct or not. However, I do understand it could be a touchy issue. Every culture/country has one. And to eliminate (okay, that could be impossible) or reduce racism and ethnocentrism we could probably start by censoring ourselves?